Circulating tumor cells (CTCs) have shown promising potential as liquid biopsies that facilitate early detection, prognosis, therapeutic target selection and monitoring treatment response. CTCs in most cancer patients are low in abundance and heterogeneous in morphological and phenotypic profiles, which complicate their enrichment and subsequent characterization. Several methodologies for CTC enrichment and characterization have been developed over the past few years. However, integrating recent advances in CTC biology into these methodologies and the selection of appropriate enrichment and characterization methods for specific applications are needed to improve the reliability of CTC biopsies. In this review, we summarize recent advances in the studies of CTC biology, including the mechanisms of their generation and their potential forms of existence in blood, as well as the current CTC enrichment technologies. We then critically examine the selection of methods for appropriately enriching CTCs for further investigation of their clinical applications. In tumor development, cancer cells acquire sequential genetic and epigenetic alterations, each of which confers some form of increased adaption, resulting in heterogeneous tumor cell populations . Some of these heterogeneous populations can leave the primary tumor and relocate to a distant site where they adapt to the new environment and evolve to novel clones to form metastases [1-7]. This spatiotemporal dynamic heterogeneity in tumor cell population, caused by adaption-related evolution, is one of the major reasons for the development of resistance to chemotherapy or radiotherapy. Thus obtaining real-time disease information is highly desirable for cancer treatment. Although traditional imaging and tissue biopsies remain as the standard in cancer diagnosis and in monitoring treatment response, these approaches cannot overcome the constraints caused by the spatiotemporal dynamic heterogeneity of cancer cell populations and do not allow visualization of minimal residual disease. For this reason, an alternative diagnostic method, liquid biopsy, which may overcome these constraints, has gained increased attention in cancer research in the last few years. Liquid biopsy is a technique for sampling and analyzing critical biomarkers in nonsolid biological tissue, primarily blood. Circulating tumor cells (CTCs) are derived from tumors as an early step in blood-borne metastasis, which is transient in blood with a half-life of 1 to 2.4 hours [8-10]. Studies from both animal models and cancer patients demonstrate that CTCs have a promising potential as a liquid biopsy that can facilitate early detection, prognosis, therapeutic target selection, and monitoring therapeutic response. CTCs in most cancer patients are low in abundance-usually lower than 10 cells per milliliter [11-15]. However, in some rare outliers, CTCs might be as high as hundreds or even thousands per milliliter of blood. Therefore, a CTC biopsy generally begins with an enrichment step to raise the concentration of CTCs by several log units before they can be characterized. A number of methodologies based on biological and physical differences between CTCs and blood cells have been developed for CTC enrichment over the past few years. However, huge divergences in the characteristics of CTCs are harvested from different enrichment methods due to the similarities between CTCs and blood cells, as well as innate CTC heterogeneity [16-18]. Improving the reliability of CTC biopsy, a deep understanding of phenotype variation of tumor cells on the molecular level during their release from the primary tumor and while traveling in the circulation, even during disease development and therapeutic processes, is highly desirable for improving CTC enrichment and characterization technologies. In this review, we summarize recent advances from studies focusing on the biology of CTCs, including the mechanisms of their generation and their potential forms of existence in blood, as well as current CTC enrichment technologies. We then examine the selection of methods for appropriately enriching CTCs for further study of their clinical applications. During their metastasis to a distant site mainly through circulating blood, cancer cells often execute a cascade of intravasation-translocation-extravasation-colonization. This process includes their release from the primary tumor, entrance into the bloodstream, infiltration from the blood vessels to distant tissues where the cells as latent seeds of metastases need to survive and adapt to the supportive niches, and eventually develop into overt metastasis . Cancer cells tightly adhere to their neighboring cells in part through their tight junctions, desmosomes and hemi-desmosomes and, at the same time, are surrounded by a complex stroma that is composed of an extracellular matrix (ECM) and neo-angiogenic blood vessels with or without a basal membrane (BM) [1, 19]. Initially, the property of adherence and the stroma serve as physical constraints to prevent distant metastasis. Hence, carcinoma cells have to overcome these barriers by enhancing motility in the stroma and invading into the blood through EMT or non-EMT mediated active or passive entry. The living CTCs in circulation might eventually arrest at the primary tumor, other metastatic lesions or at new distant sites. The arrested CTCs might then extravasate, possibly supported by the mesenchymal-to-epithelial transition (MET), and undergo dormancy or engraftment and colonization. The current findings on the mechanisms explaining how CTCs are generated as well as their forms of existence in blood are summarized in Fig. 1. Mechanisms of circulating tumor cell (CTC) generation and the potential CTC subpopulations existing in the blood circulation. Two main mechanisms are involved in cancer cells leaving the tumor and moving to the blood. 1) CTCs undergo epithelial-mesenchymal transition (EMT) or 2) non-EMT-mediated invasion. 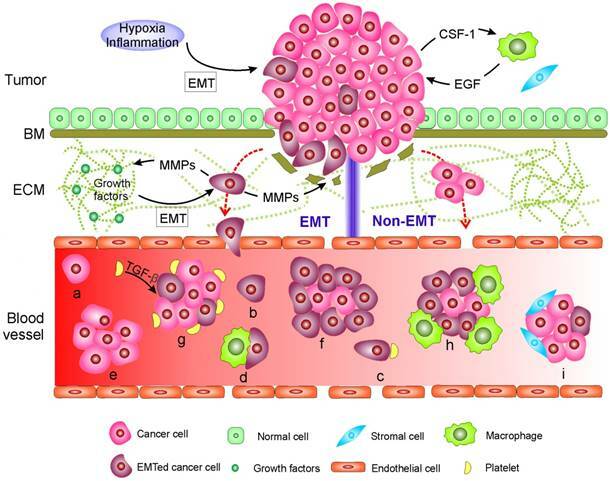 In EMT-mediated invasion, cancer cells actively adopt cellular programs to break down the basement membrane (BM), migrate through the extracellular matrix (ECM), and enter the blood. In contrast, in non-EMT-mediated invasion, cancer cells enter the blood either through centrosome amplification-triggered invasion or through passive infiltration initiated by external forces. In both mechanisms, CTCs can leave tumors as single cells or in clusters. Once reaching the blood, CTCs might be present in one or more of the following subpopulations: (a-d) single cells with a different EMT phenotype that might further bind to platelets and/or macrophages; or (e-i) in clusters with a different EMT phenotype that may be further cloaked by platelets, macrophages, and/or reactivated stromal cells. Two main biological mechanisms are involved in the release of CTCs from the tumor into the circulating blood. The first occurs through the epithelial-mesenchymal transition (EMT) and the second involves non-EMT-mediated invasion. EMT is a dedifferentiation process in which epithelial cells depolarize, partially or completely lose intracellular contacts by ending the expression of epithelial markers, and gain mesenchymal traits that confer stem-like properties and favor migration [20, 21]. Not surprisingly, metastasis usually involves EMT [20-23]. During carcinogenesis, epithelial cells gradually lose their apicobasal polarity and growth control . Concurrently, a cancer-associated stromal niche is gradually formed [1, 19]. Activation of EMT in cancer cells often requires interactions between these cells and reactivated stromal cells in their surroundings, which is also designated as an inflammation environment . The cancer cells recruit stromal cells [25, 26], respond to various EMT-inducing signals released from the stromal cells, such as various cytokines, and activate certain transcription factors (e.g., SNAIL, TWIST, and ZEB), microRNAs , epigenetic machinery , and post-translational regulation , leading to EMT [1, 21, 26, 29]. Activation of an EMT program can also be induced by hypoxia . To promote further migration through the BM and ECM, invasive cancer cells remodel their surrounding stroma by up-regulating various ECM-degrading proteases, such as matrix-metalloproteinases (MMPs) and cathepsins, to excavate passageways . Note that during the degradation of ECM components, MMPs also catalyze the release of certain cell-surface and matrix-bound growth factors and cytokines from ECM, all of which further facilitate the growth and survival of cancer cells as well as constructing a supporting tumor microenvironment . The synergistic effect of EMT-induced cytoskeletal rearrangements within cancer cells, MMP-mediated passageway excavation, and adhesive interactions between cancer cells and ECM all drive the invasion and migration of cancer cells through the stroma. Invasive cancer cells enter the blood by their synergistic effects of passive infiltration and active transendothelial migration. Passive infiltration benefits from the intrinsic leaky and torturous vasculature in the tumor environment, which is generated to facilitate the supply of nutrients and oxygen needed for tumor growth . Molecular programs might be further adopted by cancer cells to regulate vasculature permeability and promote transendothelial migration [33-37]. Invasive cancer cells can migrate through the stroma and blood vessels as single cells or in clusters, which are designated microemboli [38-44]. Single cells often exhibit EMT-associated changes, whereas clusters appear to maintain cell-cell connections and harbor a mesenchymal edge . Clusters can either exclusively contain cancer cells or consist of cancer cells and reactive stromal cells (e.g., cancer-associated fibroblasts) [45-47], in which distinct cell clones cooperate to promote mutual survival and metastatic ability [40, 43]. Invasion and metastasis can also occur independently of EMT. This idea is based on recent studies with transgenic mouse models suggesting that EMT might be dispensable for initiation of metastasis [48, 49]. These transgenic mouse models harbor deletion of transcription factors that regulate EMT (e.g., SNAIL or TWIST) and suggest that suppression of EMT in the primary tumor does not alter the emergence of systemic metastasis . Furthermore, Godinho, et al. reported that centrosome amplification can trigger cancer cell invasion by disrupting cell-cell adhesion by increasing Arp2/3-dependent actin polymerization. In addition, passive infiltration initiated by external forces, such as tumor growth and mechanical forces (e.g., surgery), might cause the formation of “accidental CTCs” in circulating blood [51-53]. The disseminating cancer cells originating from non-EMT-mediated invasion might also consist of single cells or clusters and retain their epithelial phenotype ,. Once cancer cells reach the circulating blood, most CTCs will undergo apoptosis due to a lack of a correct cellular/ECM attachment or other hazards present in the blood environment, including components of the innate immune system, shear force or oxidative stress [54-57]. Only camouflaged cancer cells tend to adapt to the circulatory environment and evade the immune defenses to complete the rigorous metastatic process [58-60]. To resist death, CTCs essentially reshape the integrin expression profile and activate cellular signaling such as the Akt signal transduction pathway through context-dependent mechanisms . To escape immune surveillance, cancer cells might up-regulate various surface proteins, such as CD47 [14, 62-64], PD-L1 , and vascular cell adhesion molecule 1 (VCAM-1) , which bind to macrophages to evade phagocytosis. To avoid oxidative stress, cancer cells show an increased dependence on the reduced nicotinamide adenine dinucleotide phosphate (NADPH)-generating enzyme in the folate pathway . Recent studies reported that cancer cells expressing tissue factor proteins on their surfaces tend to attract platelets [68, 69]. The association with platelets not only stimulates reversible metabolic changes in cancer cells that enable them to withstand oxidative stress [67, 70], but also links tumor cells with CD11b+ macrophages, establishing microclots to protect CTCs in the circulating blood . CTCs in the blood of patients with cancer usually exist as apoptotic or viable cells and might contain one or more of the following subpopulations: 1) single cells with a different EMT phenotype that may further bind to platelets and/or macrophages; or 2) clusters with different EMT phenotypes that may be further disguised by platelets, macrophages, and/or reactive stromal cells (Fig. 1 and Fig. 2A). Numerous analyses on the characteristics of CTCs have demonstrated the broad physical heterogeneity of CTCs [15, 72-75]. For example, CTCs derived from different types of tissue, or even from the same tissue, harbor large variations in CTC size [74, 76]. Most CTCs show large overall size and a high nuclear to cytoplasmic ratio compared to surrounding white blood cells (WBCs); while some CTCs show considerable size similarity with surrounding leukocytes (Fig. 2B) [74, 77]. The nuclear to cytoplasmic ratios between single CTCs and CTC clusters are similar, but cells contained in CTC clusters have less area and length, on average, than single CTCs [72, 77]. The nuclear size of CTCs has been associated recently with disease stages. Chen et al. demonstrated that three distinct CTC subpopulations with large, small, and very small nuclear (vsn) sizes were detected in the blood of patients with prostate cancer (Fig. 2C). Small nuclear CTCs and vsnCTCs were identified in patients with metastatic disease, whereas vsnCTCs counts alone were found to be elevated in patients with visceral metastases. Furthermore, comparative studies showed that the total net charge of cancer cells is significantly larger than that of blood cells [79-84]. At a more practical level, the composition of CTC subpopulations and the biological features of each subpopulation vary by cancer type, by disease stage, as well as course of therapy. In general, increased numbers of CTCs are detected as the disease progresses in individual patients [15, 85]. CTCs from a given patient may present as intact single cells with round or odd shapes, intact clusters, apoptotic cells, and/or cell fragments [15, 74, 85]. Among the patients exhibiting CTCs, the majority have only single CTCs that are detectable and a minority of patients, particularly those with advanced disease, simultaneously harbor single CTCs and clusters of CTCs that are detectable [40, 45, 75, 77]. Yu, et al. recently demonstrated that circulating breast cancer cells exhibit dynamic phenotypical composition, which varies by histological subtype and over the course of therapy (Fig. 3). In the blood of a particular patient with breast cancer, CTCs can present multiple phenotypes ranging from exclusively epithelial (E) to intermediate (E > M, E = M, E < M), and exclusively mesenchymal (M). Within one subtype, the EMT features in CTCs show individuality as well as generality. For example, the CTCs from a patient with ER+/PR+ breast cancer were predominantly epithelial; whereas those from patients with HER2+ and triple negative (TN; ER-/PR-/HER2-) breast cancer were predominantly mesenchymal. Reversible shifts between the fate of CTCs accompanied each cycle of response to therapy and disease progression. Declining numbers of M+ CTCs and CTC clusters and a switch to predominantly E+ CTCs and single migratory cells were observed in a post-treatment sample that accompanied the response to therapy; whereas an increasing number of M+ CTCs and CTC clusters were observed in the post-treatment sample once the disease relapsed. Miyamoto, et al. also showed that circulating prostate cancer cells exhibit dynamic phenotypical composition over the course of therapy. CTCs in a patient with castration-sensitive prostate cancer showed a transformation from the “androgen receptor (AR)-on” (PSA+/PSMA-) to the “AR-off” (PSA-/PSMA+) phenotype when treated with leuprolide to induce therapeutic androgen deprivation. From the description above, the idea that the innate heterogeneity of CTC could complicate their enrichment is not surprising. Various enrichment methodologies based on physical and biological differences between epithelial-derived CTCs and blood cells have been exploited (Fig. 4). The physical property-dependent enrichment methodologies include size/deformability-based filtration, density-gradient centrifugation, and electrical property-based di-electrophoresis (DEP) separation (Fig.4A). A biological property-dependent enrichment methodology can be either a positive selection procedure based on targeting surface markers exclusively expressed on CTCs or a negative selection method based on depletion of blood cells (Fig. 4A). The advantages and limitations of these methodologies are summarized in Table 1. Physical heterogeneity of CTCs. (A) CTCs exist as intact cells, clusters, or apoptotic cells. (B) Quantitative analysis of the effective diameter (maximum feret diameter) for individual CTCs and WBCs isolated in three cases, e.g., two different melanoma patients (M1 and M2) and a breast cancer patient (B3). (C) Relationship between circulating tumor cell (CTC) nuclear size and metastatic status. A-C were reprinted with permission from ref   , respectively. Circulating breast cancer cells exhibit dynamic phenotypical composition, which varies by histological subtype (A and B) and over the course of therapy (C and D). Figures were reprinted with permission from ref . (A) CTC enrichment methodologies can be summarized into physical and biological property-dependent methodologies. Physical property-dependent methodologies include size-, density-, and electrical charge-based strategies. Among the biological property-dependent methodologies, the EpCAM antibody is commonly used for positive selection. Multiple antibodies for positive selection as well as CD-45-mediated negative depletion have been introduced to eliminate loss of CTC subpopulations. Leukapheresis and GLUPI nanodetection enable the enrichment of CTCs in vivo. Devices developed to improve the enrichment efficiency include (B) the CellSearch system; (C) the CTC-Chip, the first microfluidic chip integrated into CTC enrichment; (D) the CTC-HB chip, in which a herringbone design enables passive mixing, increasing interactions between CTCs and an antibody-coated channel surface; (E) the CTC-vortex Chip, which combines the use of micro-scale vortices and inertial focusing; (F) the CTC-iChip, capable of either positive or negative selection of CTCs; (G) the Cluster-Chip, capable of isolating CTC clusters through specialized bifurcating traps. B-G were reprinted with permission from ref , , , , , , respectively. Advantages and limitations of current enrichment methodologies. Epithelial-derived CTCs were initially believed to be larger and stiffer compared to leukocytes (7-12 μm in diameter). Thus various filtration-based devices have been developed to isolate CTCs over past decades [87-91]. In this method, blood is filtered through pores that are usually 8 μm in diameter so as to trap molecules larger than the maximum pore sizes. The success of filtration is determined by factors that include blood flow rate, pore size uniformity, and membrane rigidity. High flow rates can cause CTCs, especially EMT-associated CTCs with high deformability, to 'squeeze' through pores and cause the membrane to warp, whereas slow flow rates lead to excess accumulation of leukocytes, clotting of blood and prolonged processing time . Obviously, filtration would lose CTCs the same size or smaller than the pore diameter while capturing leukocytes and other molecules that are larger. Nonetheless, because of its advantage of ease-of-use, high-throughput, and good recovery efficacy of CTC clusters, filtration technologies are continuing to be improved. In particular, improvements include using three dimensional microfilters to minimize hemodynamic stress on cells, thus sustaining cell viability  and adopting a CTC size-amplification strategy to reduce the loss of small-sized CTCs . Density-gradient centrifugation enriches CTCs in the mononucleocyte fraction in a buoyant density taking advantage of their similarity . Although it is easy-to-use and is high-throughput, density-gradient centrifugation inevitably loses CTCs, showing a maximum recovery rate of ~70%. To increase the purity of enriched CTCs, bi-specific antibodies against antigens on leukocytes and erythrocytes have been used to form large multicellular rosettes of leukocytes and erythrocytes, which are easily removed from the mononucleocyte fraction by centrifugation . To reduce the loss of CTCs with high density, a combined density- and size-based separation (e.g., OncoQuick technology), has been developed by inserting a porous barrier into a centrifuge tube . By using dissimilarities in morphological and electrical properties of different cell types, di-electrophoresis (DEP) cell separation technology has been used for enriching CTCs with high viability [79-82]. DEP field flow fractionation combines electric force fields with hydrodynamic and sedimentation forces to pull tumor cells away from blood cells. The success of the process is determined by factors that include electric field frequency, electric voltage, blood flow rates and buffer formulations. Although the viability of cells enriched by DEP is greater than 97%, the average cell recovery of DEP is still only about 70% . Beyond physical difference-dependent enrichment technologies, the most popular CTC enrichment technologies involve antibody-mediated isolation. Antibodies targeting epithelial cell surface markers (e.g., epithelial cell adhesion molecule EpCAM), which are present on carcinoma cells, but absent on the mesenchymal leukocyte surfaces, are frequently used in the positive selection of carcinoma cells from the blood . However, positive selection exclusively involving the EpCAM antibody suffers from loss of EMT-associated CTCs, “poorly differentiated, and stem-cell-like” cells and clusters, which might represent the most aggressive CTC subpopulations [16-18, 97]. To resolve this problem, many research groups are currently focusing on a search for new CTC surface markers. For example, the actin bundling protein, plastin 3, has been identified as a novel marker that is not down-regulated by CTCs during their EMT and is not expressed in blood cells . Another improvement for successful capture of heterogeneous CTC subpopulations is the use of a combination of antibodies [58, 99]. A cocktail of antibodies against mesenchymal or stem cell antigens (e.g., c-MET, N-cadherin, CD318, and mesenchymal stem cell antigen), against tissue-specific markers (e.g., PSA for prostate cancer , and mammaglobin for breast cancer ), and against various tumor-specific markers (e.g., HER2, MUC1, EGFR, folate-binding protein receptor, TROP-2, CA9, and CD147) has been created to enrich CTCs [101-103]. However, the use of a cocktail of antibodies might increase the risk of contamination by blood cells that also express at least one of these markers, and might be useless when CTCs are hidden by platelets and macrophages or when surface markers of CTCs change as the disease progresses or over the course of therapy. Importantly, both the quality of antibodies and the position of the epitope that an antibody recognizes also can influence the efficacy of positive selection. Obviously, positive selection requires an assumption about the unknown nature of CTCs in a given blood sample. This bias could be avoided by negative selection in which CTCs are enriched by depletion of leukocytes from the blood using antibodies against antigens exclusively expressed on leukocytes (e.g., anti-CD45) [74, 104]. Notably, to improve purity, cascade-negative selection might be required to deplete normal cells. Besides the development of new assays, great progress has been made in developing new devices to further improve enrichment efficiency. Whereas the CellSearch system represents a breakthrough in CTC enrichment technology both in principle and in clinical application (Fig. 4B) , the low yield of CTC capture is a major concern for its clinical value. The low enrichment efficiency is caused by several factors, including the exclusive use of the EpCAM antibody, which induces the loss of EMT-associated CTCs and CTC clusters, the ineffective collection of magnetic bead-labeled CTCs through a sticky blood sample, and the multistep batch purification process. To increase the collection efficiency of magnetic bead-labeled CTCs from sticky blood, Tasalaz, et al. developed a device that sweeps magnetic rods through the whole area of the capture wells. Integrating microfluidics into CTC enrichment technology created another milestone to improve the enriched yield and purity of CTCs. Microfluidics is a powerful technological system that is capable of performing separation and detection of small quantities of samples with high sensitivity in a short time frame . Nagrath, et al. pioneered a silicon-based micropost CTC-Chip for enriching CTCs from blood (Fig. 4C). Thousands of microposts fitted with the EpCAM antibody increased encounters between flowing cells and antibodies, thereby improving the enrichment efficiency of CTCs. However, the device is likely to disrupt CTC clusters due to the tight distances between microposts that presumably prevent the passage of large cellular clusters. Following the CTC-Chip, plenty of microfluidic devices integrated with a nanomixer and/or nanomaterials have been developed for improving enrichment efficiency as well as enabling on-chip characterization [75, 91, 108-111]. For example, the Toner group  released a transparent herringbone CTC-Chip that made use of passive mixing to increase the interactions between CTCs and the antibody-coated channel surface (Fig. 4D). The use of transparent materials allowed on-chip characterization of the enriched CTCs. Microfluidics capable of high-throughput processing under low shear conditions have also been integrated into physical difference-dependent enrichment technologies. For instance, Sollier, et al. developed a microfluidic chip combining micro-scale vortices and inertial focusing for the extraction of CTCs from blood with a purity of 57-94% (Fig. 4E). Hou, et al. constructed a spiral microchannel with inherent centrifugal forces for continuous, size-based separation of CTCs from blood. Microfluidics incorporated with negative selection enable enrichment of CTCs from virtually all types of cancer. The Toner group  further developed a CTC-iChip capable of enrichment of CTCs with either positive or negative selection (Fig. 4F). The chip first achieved size-based separation of the nucleated cells including CTCs and WBCs from RBCs, platelets and plasma. The nucleated cells were then arrayed in a near-single line due to inertial focusing as they traveled through specially configured curved channels. Inertial-focused tagged leukocytes were magnetically deflected as they traveled through microfluidic channels equipped with magnets. The untagged CTCs were delivered at an average purity of 1% in solution, which can be subjected to subsequent molecular characterization. 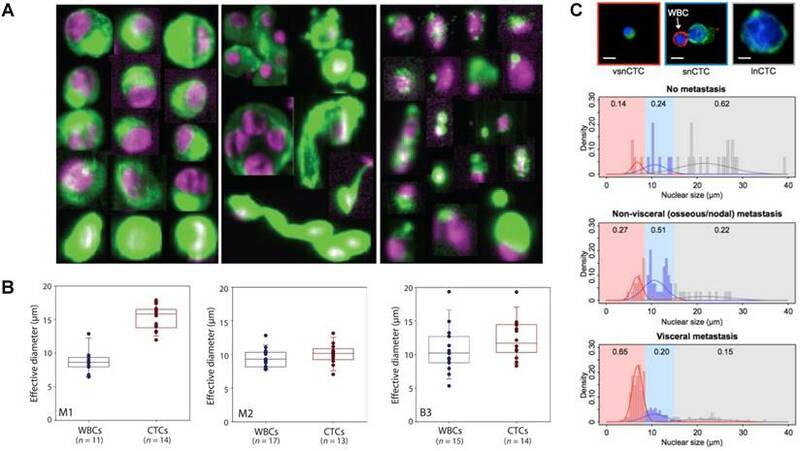 Circulating CTC clusters, ranging from large tumor cell clusters, blood clots carrying tumor cells to clumps of tumor cells mixed with reactive stromal cells [47, 112, 113] have been observed to establish metastasis more efficiently than single cells . Thus the Toner group  developed a Cluster-Chip to examine the true prevalence and significance of CTC clusters (Fig. 4G). The CTC clusters were isolated through specialized bifurcating traps under low-shear conditions that preserve cluster integrity and CTC clusters in 30-40% of patients with metastatic breast, prostate, or melanoma were identified. These CTC enrichment technologies described above are conducted to enrich CTCs from blood specimens drawn from patients with cancer. The volume of blood needed is usually less than 10 mL. However, CTC heterogeneity necessitates analysis of all CTC subpopulations in sufficient numbers. CTCs enriched from blood samples with limited volume cannot represent the whole CTC population in patients, which decreases the reliability of CTC biopsies [14, 114]. Two approaches that are capable of in vivo enrichment of CTCs with statistically meaningful numbers have been developed (Fig. 4A). One approach involves the collection of CTCs by putting a GLUPI nanodetector in a peripheral arm vein. Up to 1.5 L of blood in 30 min is supposed to pass the nanodetector coated with the EpCAM antibody . Clinical studies of patients with breast and lung cancer demonstrated that the nanodetector can enrich a larger number of CTCs compared to the CellSearch assay . The other approach is to use leukapheresis, which is a standard clinical method frequently conducted to isolate mononuclear cells from several liters of blood for various applications. Leukapheresis can recover a large number of CTCs from non-metastatic cancer patients (i.e., a median of 7,500 CTCs per patient) . Although leukapheresis shows a promising potential to enrich CTCs with statistically meaningful numbers, it is much more invasive than drawing a blood sample, which is a critical issue for clinical use. In addition to enrichment, ex vivo cultures of primary CTCs allow subpopulations of CTCs to be more fully characterized [14, 116], and enable drug sensitivity to be monitored . Although many CTC enrichment technologies based on new markers and devices have been developed, each methodology has its own advantages and limitations. The physical difference- dependent enrichment technologies share the same limitation originating from physical similarities between CTCs and leukocytes, whereas antibody-mediated positive selection might suffer from the heterogeneous CTC phenotype, which varies by cancer type or subtype, disease progression, and over the course of therapy. Therefore, none of the current enrichment technologies satisfy all the CTC applications. Choosing an enrichment strategy based upon the aim of further analysis would be optimal. According to CTC biology as well as current enrichment technologies, we now examine the selection of appropriate enrichment and characterization methods for specific applications (Table 2). Selection of appropriate enrichment and characterization methodologies for specific CTC applications. The challenges in each application as well as their appropriate enrichment and characterization strategies are listed. Studies with animal models and clinical subjects demonstrated that CTCs exist in the blood and migrate to distant organs long before a tumor is diagnosed [23, 26], indicating the potential of CTCs as a diagnostic parameter of early disease [11-13, 26]. In addition, abundant evidence shows that cancer cells in the primary tumor are able to metastasize to different organs and CTCs reaching new specific organs may adapt to the acquisition of an “organ-mimetic” phenotype [118-120]. Thus CTCs circulating from the primary tumor or metastases would present specific signatures capable of identifying their origin as well as their disseminating destination [120, 121]. The reliability of CTCs in early cancer detection and in characterization of tumor origin and metastatic sites depends on the sensitivity of method adopted and the blood volume sampled. Due to the ultralow concentration of CTCs in blood from patients with early disease, enrichment of CTCs from a large blood volume is required to achieve reliable detection. Thus in vivo enrichment methods, including the GLUPI nanodetector coated with a combination of antibodies and leukapheresis, would be ideal choices. However, the invasiveness of in vivo platforms would be a barrier for the screening of patients for early detection of cancer. CTCs in the enriched product can be identified by either immunostaining or RT-PCR [122, 123]. For identification by immunostaining, a CTC is defined as a cell that is positive for EpCAM and CK8, 18 and 19, negative for CD45, with an intracellular nucleus and at least 4 μm × 4 μm in size . Notably, down-regulation of EpCAM and CK of CTCs due to EMT might result in false negative results during molecular identification. Furthermore, CK+ and CD45- cells can also occur in patients with benign diseases of the colon [108, 124]. By using RT-PCR, before labeling a sample as positive for cancer, a validated cutoff value is required to overcome the problem of false-positives. Identification of tumor origins can be achieved by characterization of CTCs with different markers. For example, CK7 and PSA/PSMA have been used to identify CTCs for lung cancer and prostate cancer, respectively . A recent study showed that CTCs in patients with breast cancer brain metastases have a specific protein expression signature of HER2+-EGFR+-HPSE+-NOTCH1+-EPCAM- . One well-validated clinical application of CTCs is the assessment of their prognostic value at pretreatment baseline in patients with known metastatic cancers including breast , prostate [127, 128], melanoma , and colon [130-132]. The main challenge of using CTCs as a prognostic marker is enumeration of all CTC subpopulations in a blood sample with a given volume. The main methodology adopted in current clinical trials is the CellSearch assay . However, as indicated above, exclusive EpCAM antibody-mediated positive selection usually results in false negative results due to loss of EMT-associated CTCs and CTC clusters. To enrich all CTC subpopulations in a given blood sample, negative selection integrated with microfluidics (e.g., CTC-iChip) would be ideal. Furthermore, direct detection of CTCs in blood samples by microscopy with automated scanning technology is an ideal alternative in which the CTCs are mounted directly on a slide that is labeled with flurophore-conjugated antibodies [133-136]. Treatment of cancer, especially metastatic disease, is usually complicated by the systemic nature of the disease, the heterogeneity of metastases, the multitude of genes and pathways involved in different organs, as well as drug resistance . Studies on CTC characteristics showed that the genomic profiles of CTCs are largely comparable to primary tumors and metastases, suggesting that CTCs can provide a snapshot of the molecular landscape of a patient's overall tumor characteristics at the time of blood draw [137, 138]. This can potentially provide a predictive marker for guiding tailored choices of precise treatment for specific patients at distinct times [139-141]. For example, Heitzer, et al. found that in CTCs from colorectal cancer patients, mutations in known-driver genes, such as apc, pic3ca, and kras, could be detected in the matched primary tumor, metastases and CTCs, suggesting the promising potential of CTCs as a predictive marker in colorectal cancer . Furthermore, detection of CTCs can reveal tumor cells that present at a subclonal level in the primary tumor and metastases, which might be ignored in a tissue biopsy. For example, ALK-rearranged CTCs were detected in ALK-negative patients with NSCLC , which will be useful in guiding therapy because ALK-rearrangement-positive NSCLC patients do not benefit from EGFR tyrosine-kinase-inhibitor (TKI) therapy and need to be treated with an ALK inhibitor . In addition, establishing CTC-derived xenograft (CDX) models to test their susceptibilities toward various clinically relevant drug regimens could provide promising potential in personalized cancer therapy because CTCs represent real-time disease information [14, 117, 145, 146]. Enrichment of CTCs, especially those with high metastatic and therapy-resistance potential, such as CTCs with high plastic EMT-associated phenotype and various CTC clusters [14, 28, 47, 112, 113], in a living state with a statistically significant number is of utmost importance to establish the CDX model. The challenge of these applications is characterizing all CTC subpopulations in numbers sufficient for statistical significance. As indicated earlier in the CTC biology section, CTCs might be cloaked by platelets, macrophages and/or reactive stromal cells and could exhibit dynamic molecular and phenotypical composition as disease progresses and over the course of therapy. 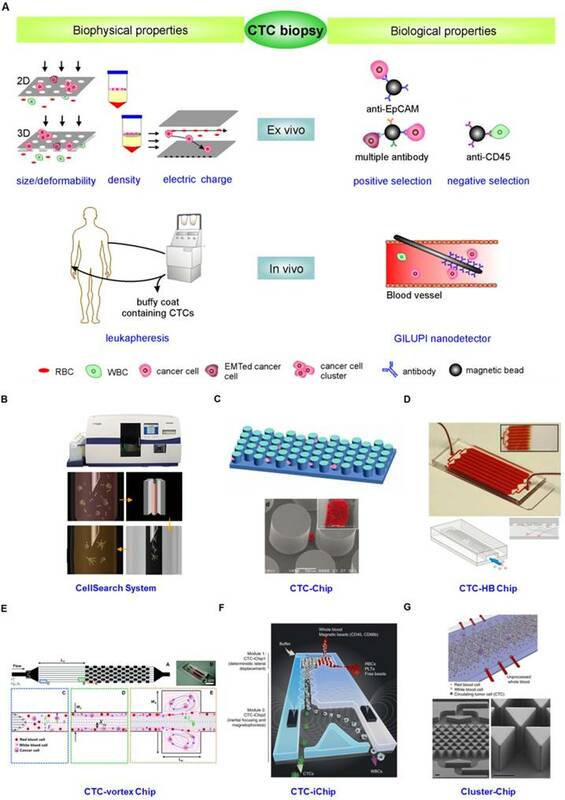 Thus to enrich the numbers of all CTC subpopulations to reach statistical significance, negative selection integrated with microfluidics (e.g., CTC-iChip) and a method combining density and size-based separation (e.g., OncoQuick technology) would be ideal methods for blood samples with a high concentration of CTCs (e.g., blood samples from patients with SCLC in advanced stages) , while leukapheresis might be appropriate for patients harboring ultralow concentrations of CTCs in their blood. Besides enrichment methodologies, selecting the appropriate characterizations is also crucial to gain meaningful results from analysis. Genomic characterizations by various genotyping techniques are usually involved in the identification of genomic profiles of CTCs, including point mutations, rearrangements, small insertions/deletions and gene amplification. The genotyping techniques include RT-PCR, in situ hybridization (ISH), comparative genomic hybridization (CGH), mutational assays, next-generation sequencing (NGS), and single-cell analysis . Notably, when using partially purified CTC populations, digital subtraction of background leukocyte levels is essential for deriving CTC-based expression profiles [9, 148]. Single-cell analysis of CTCs could provide important advantages in eliminating the effect of background leukocytes. Among the genotyping techniques developed, single-cell analysis of CTCs not only provides an important advantage in eliminating the effect of background leukocytes, but also offers great promise for more comprehensive genomic and transcriptomic coverage, shedding light on the intra- and inter-patient genetic heterogeneity as well as changes after treatment. Initial single-cell analysis of CTCs mainly focused on DNA-single cell sequencing (SCS) to profile copy number and assess DNA mutations in CTCs for comparison to matched primary and metastatic tumors [138, 142, 149, 150], and also centered on RNA-SCS to study the transcriptional programs of CTCs [40, 151, 152]. Genomic analyses showed that although the copy number profile of CTCs was highly similar to that of primary and metastatic tumors, point mutations displayed extensive variability. For example, Ni et al. performed exome sequencing of single CTCs from eleven lung adenocarcinoma cancer patients. Only 59% of the point mutations found in the primary and metastatic tumors were detected in CTCs. Recently, DNA-SCS and RNA-SCS of CTCs have been used to investigate genome evolution and transcriptomes in response to therapy [153, 154]. Particularly, the interpretation of genetic information might not be sufficient to elucidate the activated pathways that are ultimately the target of therapeutic intervention, and thus epigenetic-, proteomic- and metabolomics- analyses of CTCs are desirable, again ideally down to the single cell level. To establish the CDX model, the enriched product can either be directly injected into mice or injected into mice after isolation of specific CTC subpopulations by fluorescence activated cell sorting (FACS). Progress towards sensitive and rapid CTC detection has been impressive; nevertheless, significant opportunities to address more fully the goals of this field still exist. As CTC biology indicates, CTCs might be cloaked by platelets, macrophages and/or reactive stromal cells and could exhibit dynamic phenotypical composition as the disease progresses and over the course of therapy; however, physical properties such as size remain relatively stable during disease progression. Therefore, compared to positive selection, physical property-dependent enrichment methodologies and negative selection might be more reliable and adaptable for in vitro enrichment of CTCs from the blood of patients with most types of cancer. However, further advances in these methods are needed to obtain a population of highly pure CTCs, which would facilitate the accuracy of subsequent molecular characterization. In addition, automatic platforms integrating CTC enrichment with subsequent molecular characterization are highly desirable to enable the generation of accurate results even in the absence of a highly trained operator. Well-designed microfluidic devices that integrate enrichment strategies involving cascade physical property-dependent and antibody-based selections with subsequent molecular characterization might provide a fully automated platform. Furthermore, to improve the capability of CTCs to serve as a predictive marker, technologies for high-throughput single cell analysis will be in high demand because of CTC heterogeneity. CTCs derived from tumors released into the blood are low in abundance and show high heterogeneity in their morphological and phenotypic profiles. 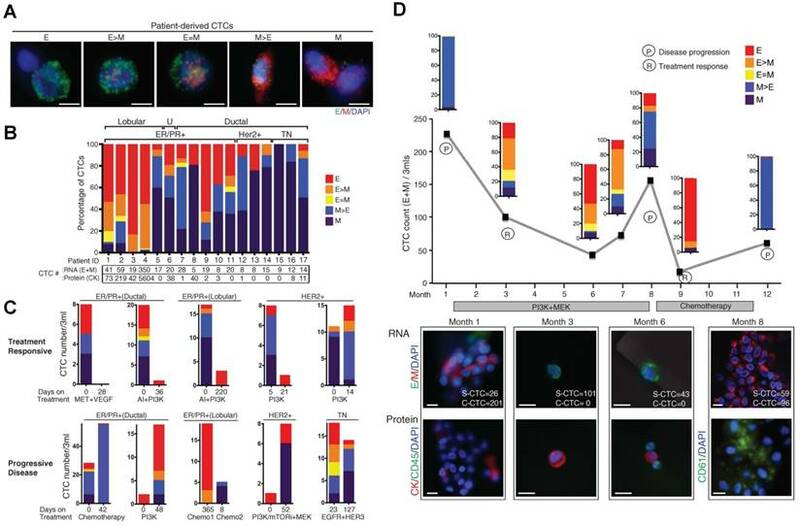 Recent studies further demonstrate that CTCs exhibit dynamic biological profiles, which vary by cancer type, as disease progresses and over the course of treatment, which further complicates their enrichment and characterization. This review presented the most recent advances in CTC biology, summarized current CTC enrichment methodologies and examined the selection of appropriate enrichment and characterization methods for specific clinical applications. The hope is that the present framework will stimulate further improvements in the detection and characterization of CTCs and assist in translating the CTC biopsy from the laboratory to clinical practice. This work was supported by The Hormel Foundation and National Institutes of Health grants CA166011, CA187027 and CA196639.